Your child may not have had the chance to live through the age of disco, but that doesn't mean you have to deny him the full 1970's experience. You can get him a disco ball, slip a pair of platform shoes on his feet and queue up your favorite funky tunes to let his soul shine. You can even teach him all of the best 70's slang, ya dig? Of course, the first place you need to start to have your kid feeling like a funkadelic dance-master is a groovy outfit and it just so happens, since we're the number one experts on costumes on the web, we have the perfect outfit for your little one to shake his groove thing! This Boy's Funky Disco Costume brings your kid some funky fresh style that he can take to any dance floor. The costume comes with a bright blue satin, button up shirt with high collars. 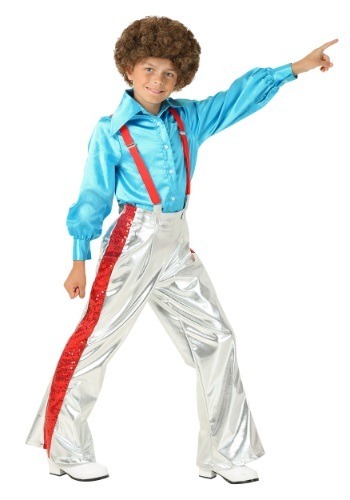 The shining silver pants feature a stripe of red sequins down each pant leg and fit with a set of bright red suspenders. All your kid will need to top off the look is a rocking afro, some crazy cool moves (better teach him how to do the hustle).